The village of Štrbské Pleso lies 1346 meters above sea level, on the south shore of Štrbské Pleso lake, and is an important tourism and winter-sports centre. Its name originated from the historical name of this region. Villages of Podbanské (partly) and Vyšné Hágy belong to the district of Štrbské Pleso too. The village Štrbské Pleso itself has been incorporated the village of Štrba. 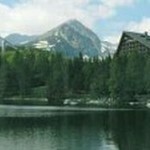 Štrbské Pleso is the most famous and most frequently visited tarn in High Tatras. The oldest written historical record of the tarn can be found in the work Bibliotheca seu Cynosura Peregrinantium (1644) by Dávid Frölich. Juraj Buchholtz mentioned distillation of pine and dwarf pine oils in this region (1719). The tarn had already been known to coalmen, woodcutters and herbalists when the first tourists came here. In 1860, the people living in the village of Štrbské Pleso made an attempt to let out the water and get some pastureland from “the useless puddle”. The tarn had been in possession of the family of Szentiváni until 1901 when the Austro-Hungarian Empire bought it from them. Fishes has been artificially fit in the lake since the end of the 19-th century. Ice from the tarn was used for cold storage purposes because it was very clean (it was even exported to Budapešť, Berlin and Vien). The oldest picture of the tarn was painted by Ján Jakub Müller around 1825. The first reliable measurement of its depth and water level were made by Dionýz Dezsö in 1875.